In this Photoshop photo editing tutorial, we're going to learn how to reduce the appearance of 5 o'clock shadow and beard stubble in a photo. Of course, if the photo is of a guy out in the rugged outdoors and he's dressed like he's off to wrestle with a mountain lion, you may not want to remove the stubble. But in other types of photos, it may just make him look like he could use a rest, or maybe he's been resting a little too much, in which case you'll want to remove it, or at least reduce it. We're going to see how to do that here. Go up to the Filter menu at the top of the screen, select Noise, and then select Dust & Scratches, which brings up the Dust & Scratches dialog box. We're going to use it to blur away the stubble. Increase the Radius value in the Dust & Scratches dialog box until there's nothing left of the stubble. You're going to end up blurring out the entire photo at this point, but that's okay. Ignore the rest of the photo and focus only on the stubble areas. Once you've smoothed those areas out, click OK. The image in Photoshop after applying the Dust & Scratches filter. We're going to create a pattern out of the blurred image. We'll be using the pattern with the Healing Brush in a moment, but for now, go up to the Edit menu at the top of the screen and choose Define Pattern. Choose Edit > Define Pattern, then name your pattern. Click OK once you've entered a name, and the pattern is created. We need to revert the image back to the way it was before we applied the Dust & Scratches filter at this point, so to do that, use the keyboard shortcut Ctrl+Z (Win) / Command+Z (Mac) to undo the filter. 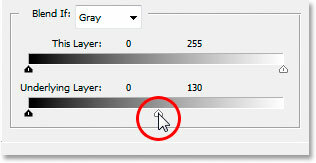 With the Healing Brush selected, set its Source to "Pattern" in the Options Bar. 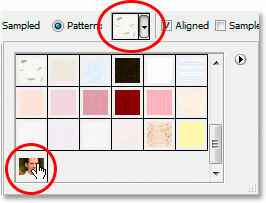 Click the pattern preview area, then click on the pattern you created to select it. 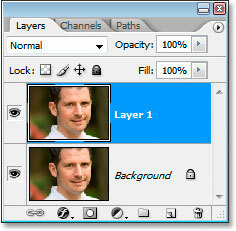 Make sure "Aligned" and "Sample All Layers" are checked in the Options Bar. 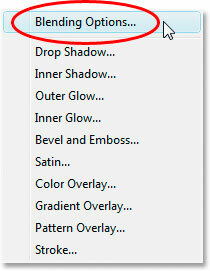 Photoshop's "New Layer" dialog box. Name the new layer "healing". 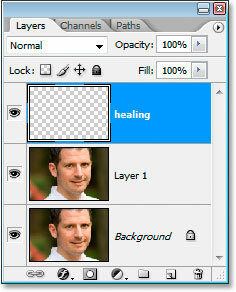 The new blank "healing" layer at the top of the Layers palette. Lower the opacity of the "healing" layer to 50%. Begin painting over the stubble areas with the Healing Brush. If you need to change the size of the brush, use the left and right bracket keys to increase or decrease the brush size as you paint. Continue painting with the Healing Brush until you've covered up all the stubble areas. Use short brush strokes and make sure to release the mouse button after each one to give Photoshop a chance to apply the healing. The image after covering up the stubble with the Healing Brush. Increasing the opacity of the "healing" layer to 65%. 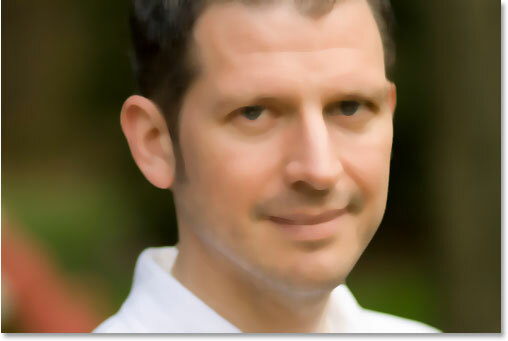 The stubble is less noticeable now after increasing the opacity of the "healing layer". The problem is, the bottom area of his face is looking a little blurry. I'm going to fix that next. Right now, my "healing" layer is affecting not only the man's stubble, it's also affecting a lot of his skin, causing things to look a bit blurry. What I really want is for the healing layer to affect only the stubble and leave his skin alone. How can I do that? Well, his stubble is very dark, while his skin is much lighter, which means I should be able to use Photoshop's Blend If sliders to limit the "healing" layer to only the darkest parts of his face, which is the stubble. Let's try it. 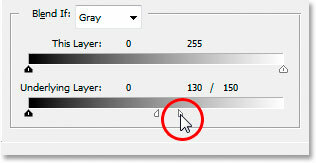 Choose "Blending Options" from the top of the Layer Styles list. 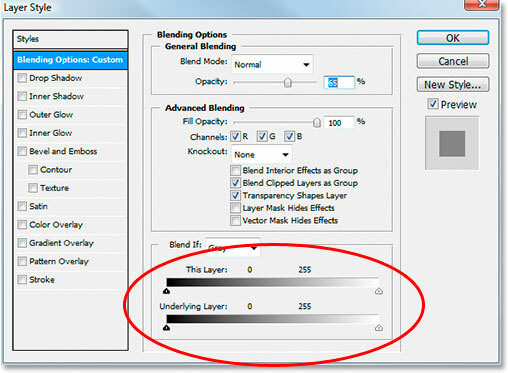 The "Blend If" sliders are at the very bottom of the Layer Style dialog box. 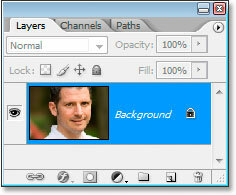 Drag the bottom white point slider towards the left to reveal the original skin texture. Stop when the stubble begins to appear. Hold down "Alt" (Win) / "Option" (Mac) and drag the slider back towards the right, splitting it in half and creating a smooth transition. And there we have it! 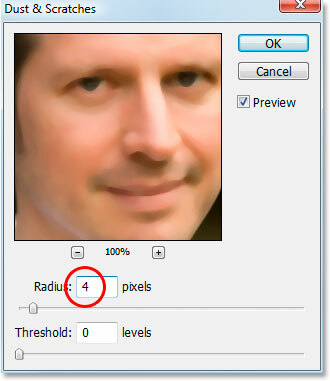 That's how to reduce the appearance of 5 o'clock shadow and beard stubble in Photoshop! Check out our Photo Retouching section for more Photoshop image editing tutorials!